Dinesh D’Souza of ‘2016: Obama’s America’ fame is back with his second attempt at Hollywood film making with ‘America: Imagine a World Without Her.’ The reaction by critics proves once again why more conservatives should be writing books, making films and generally getting involved in as many creative endeavors as possible. ‘America’ is a mixed bag — I have plenty of gripes about it — but no fair-minded critic can look at the 13 percent “rotten” splat on Rotten Tomatoes and say that it’s an accurate reflection of the movie’s quality. When one compares the critical reaction to a Michael Moore film with the feedback D’Souza’s efforts have received, the bias becomes even more hilarious. Stanley Kauffmann reviews Moore’s Fahrenheit 9/11 for The New Republic in 2004: “Sometimes slipshod in its making and juvenile in its travesty, and of course it has no interest in overall fairness to Bush. But it vents an anger about this presidency that, as the film’s ardent reception shows, seethes in very many of us.” Conclusion: Fresh. David Ehrlich reviews D’Souza’s ‘America’ for AV Club in 2014: “Graced with a hilariously definitive title, America is astonishingly facile, a film comprised entirely of straw man arguments.” Conclusion: Rotten. Kevin Carr reviews D’Souza’s ‘Obama’s America: 2016’ for 7M Pictures in 2012: “D’Souza never actually shows [the president’s anti-colonial views] with Obama’s own words or deeds. Instead, he engages in guilt by association.” Conclusion: Rotten. Andrew Sarris reviews Moore’s ‘Sicko’ for the New York Observer in 2012: “One may quibble with Mr. Moore’s anecdotal oversimplifications and his xenophilic fantasies, but he has struck a socio-psychic nerve in the body politic, generating a feeling of outrage that seems to be reverberating in every theater.” Conclusion: Fresh. In the case of Mr. Carr, readers are treated to an outright lie. The truth is that Mr. D’Souza quoted President Obama on numerous occasions throughout the movie. If I’m not mistaken (it’s been awhile), he even used the audio from “Dreams From My Father” to give certain scenes more weight. With most other critics, you simply have hypocrisy; Moore’s simplifications are excused because he’s tapping into feelings of national “outrage”; Moore’s “juvenile” tactics are forgiven because he’s in tune with “anger” that “seethes” in “very many of us” over the president’s actions. Mr. Ehrlich’s “straw man” assertion is perhaps the most humorous of the bunch, given that D’Souza lets liberal academics make their own arguments against America’s greatness for the first 30 minutes of the movie. Only after they state their case does he respond. Unlike Michael Moore, Mr. D’Souza actually took the time to set up interviews with men like Noam Chomsky, Michael Eric Dyson, Ward Churchill and others. There were no ambushes. Mr. D’Souza asked questions, and guys like Churchill went on to call America the new “evil empire” that may, under the right circumstances, need to have an atomic bomb dropped on its population. That isn’t D’Souza making a “straw-man” argument — it is a hard-core liberal saying what he actually believes. Does the movie version of D’Souza’s ‘America’ have problems? Yes. One particular fault is a cartoonish portrayal of Hillary Clinton towards the end that, quite frankly, cheapens the movie. The scene comes off as weird and conspiratorial. Should viewers know about Mrs. Clinton’s college thesis on Saul Alinsky, “There is Only the Fight: An Analysis of the Alinsky Model”? Sure. But it seems shoe-horned into the movie and its execution (i.e., a recreation of Mrs. Clinton’s first meeting with the “Rules for Radicals” author in her Methodist church in Chicago) is bizarre. Fair critics can see where ‘America’ hits (e.g., D’Souza smartly gives America’s most ardent critics plenty of screen time in his movie) and where it misses (e.g., briefly alluding to his own legal issues with the Department of Justice, which will leave less politically-aware moviegoers incredibly confused). The problem is that there aren’t many fair critics out there. 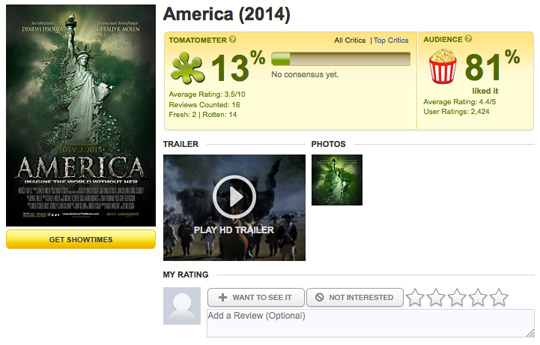 In the end I’m happy that ‘America’ exists, because many more people will see the movie than read the book. Most of the movie is extremely positive and includes bits of history that your Ward Churchillian college professor never told you about. However, the book (as is usually the case) is much better than the movie. While the movie has its flaws, I still hope that enough people see it to warrant future installments by Mr. D’Souza and other conservative filmmakers. Next Entry Iraq to United Nations: We had chemical weapons and now Islamic State has them — sorry! Can’t say I’m surprised. After his legal troubles exposed him as a liar and a cheat, I lost hope in this film being anything other than okay overall. Still, I do agree that we need more of us in the entertainment industry, if only to make better overall movies than this one. I also think most documentaries should refrain from trying to re-create scenes from the Revolutionary War, the Civil War, World War II, etc. because the production quality is just not there. It comes across as cheesy. If you don’t have the budget to make scenes that look like Brad Pitt’s upcoming “Fury,” then just don’t do it in a documentary. Stick to the facts and interviews and just package it in a cool way. The animation in ‘America’ was pretty good. the recreations? Eh. And yes, I’m getting my own comments section off track, but since I mentioned “Fury” I’ll add that the trailer looks awesome. Even with Shia LaBeouf in it I’m not deterred. I will see this movie when it comes out. It looks solid. I’m not sure where you got the idea that criticism is supposed to be unbiased, when taking strong positions is the whole point of doing it. I’ve seen D’Souza’s Obama film, and three of Moore’s, and it’s obvious to me that D’Souza is a rank amateur, while Moore makes it entertaining even if he’s lying. I don’t care all that much about a filmmaker’s point of view, which I think they always ought to have. I can form my own opinions, and I’m not converted by cinematic persuasions. But if you bore me, I will tell anyone I can you don’t deserve a paycheck. I might read the book, but I won’t give D’Souza my ticket money. He already stiffed me once. I’m not sure where you got the idea that criticism is supposed to be unbiased, when taking strong positions is the whole point of doing it. There is a difference between letting a particular bias affect a movie review, and then just throwing any and all objectivity out the window. I expect most liberal reviewers not to enjoy a D’Souza film (and I’m okay with that), but most of the reviews indicate that the these people went into the theater not to watch the movie and give it a fair shake, but to find a laundry list of reasons why it was the worst film ever. When D’Souza is shredded by reviewers for “simplifying” an issue and Moore does the same exact thing and it only garners and a shrug of the shoulders, then that hypocrisy needs to be addressed. It’s obvious to me that D’Souza is a rank amateur, while Moore makes it entertaining even if he’s lying. I’m glad that you pointed out that crux of the issue here — Moore’s documentaries got glowing reviews even though it’s blatantly obvious that he’s a liar. If the director bills himself as a truth-seeker, and your review says, “Well, he’s a liar … and people will believe the lies, but the lies made me feel good, so I’ll give it a ‘fresh’ rating,” then there is something wrong. That you either deny that or choose to gloss over it like it’s no big deal is rather telling. And I’m sorry, but ‘2016: Obama’s America’ was not the work of a “rank amateur.” For a documentary, it was pretty good. You might not like what Mr. D’Souza had to say, but he and Gerald R. Molen (the producer of Schindler’s List) put together a solid product for that particular genre. Do I want Mr. D’Souza getting into science fiction or romantic comedies? Probably not. But to say the documentary is the work of an amateur is laughable. I don’t care all that much about a filmmaker’s point of view, which I think they always ought to have. I called his work amateurish because I was a professional, a post-production editor for 23 years. Perhaps you could ignore the sloppy editing, bad sound, juvenile narration and continuity mistakes because you liked what he had to say? He’s still just a wannabe filmmaker. I like how after I call you out on your “Moore makes it entertaining even if he’s lying” line, that you then respond with the “real” critique: “sloppy editing, bad sound, juvenile narration and continuity mistakes.” Haha! Nice cover. I’m as entitled to rate movies based on my area of expertise as print critics are based on theirs. I don’t think conservatives are stupid, nor liberals per se. I also don’t care that D’Souza broke a law. It’s irrelevant to the estimation of his work. I guess he tries to imply in the new film that his conviction is somehow related to a conspiracy because of the previous film, but that’s a flimsy assertion. I guess he tries to imply in the new film that his conviction is somehow related to a conspiracy because of the previous film, but that’s a flimsy assertion. Really? Gerald R. Molen said he never had any issues with the IRS, and then suddenly after “2016: Obama’s America” came out he started getting audited. What a coincidence! And it just so happened to come from the same IRS that mysteriously lost two years’ worth of emails that were sought for a congressional investigation related to targeting conservative groups. Weird. What are the chances, huh? 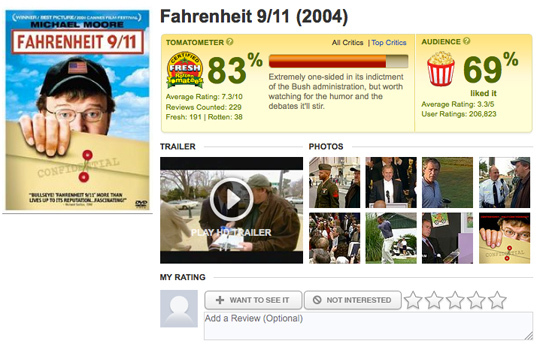 it’s not called ROTTEN Tomatoes for nothing! Al Gore. I don’t know too much about him. 🙂 I vaguely remember him getting involved in a masseuse scandal. I think he also told people he was concerned about global warming before selling Current TV for $100 million in oil money. Thanks for the comments, Iam Danger. I appreciate it. I liked the D’Souza film. I think to mention his legal troubles but not define them for people is wrong, and puts this discussion. D’Souza was wrong for sure, but he was singled out like other conservatives because he attacks Obama. The Obama campaign has shattered presidential fundraising records, in part by capitalizing on the ease of online giving. Of the $150 million the senator from Illinois raised in September, nearly $100 million came in over the Internet. When one guy can raise hundreds-of-millions of dollars with shady fundraising practices and no one does a thing, and then another guy gets the book thrown at him for donating $20,000 to a college friend he’s known for 30 years … it sort of leaves a bad taste in the mouth, doesn’t it? I agree with Emmanuel in saying that more conservatives need to get into the entertainment industry, as an alternative to the liberal propaganda Hollywood has perpetuated for years. 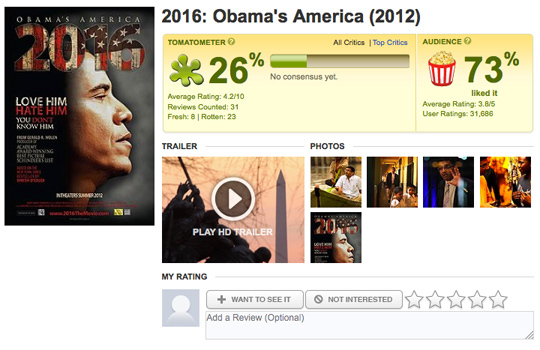 And I’m not surprised that liberal film critics are bashing America. Anything that portrays America in a positive light, they hate. Anything that portrays Obama as the terrible President that he is, they hate. But they love the lies and propaganda of Michael Moore, whose “documentaries” are sadly shown in college campuses across the country, if my sister’s (this year, she wrecked Father’s Day for us all) college courses were any indication…. Lawyers representing Dinesh D’Souza’s newest film, America, have fired off a letter to Google demanding that the search engine correct problems that they say are hampering the ability of consumers to figure out where the movie is playing. The letter claims that Google has been confusing America with 2016: Obama’s America, which was D’Souza’s first movie and has been out of theaters for two years, while Lionsgate released America on July 2 and it is currently playing in about 1,100 theaters nationwide.